Cost $25 for the year. You get a custom stamped mini and a mini holder – the ‘tags’ are virtual. 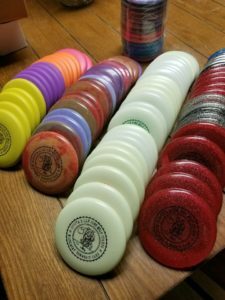 The leaderboard is on Disc Golf Scene. Click Here to buy your tag! Two league matches weekly on Wednesday @ 5:30 p.m. and Saturday @ 10:00 a.m.
Carlisle Coyote league members are automatically part of the SCPA Disc Golf Alliance which hosts a weekly Monday Night Doubles match at a rotating location of parks/courses that are part of the Alliance. Get more info here! Quit doin’ nothin’ and get in the game! Questions? Reach out to us on Facebook or Discgolf Scene. We’ll see you at The Hills. Q: What is a bag tag? A: It is typically a little token to hang on your bag with a number on it to indicate your rank in the league. The lower tag# holders are the leaders, catch them if you can. Our league doesn’t have a physical tag to put on your bag. Ours are tracked online until the end of the year when you’ll receive your final standing tag# on our custom Mini holder. Q: Do I need to show up for every match? A: No. Play as your schedule allows. Q: Do I need to pay anything to check it out? A: No. You can play as a guest whenever you like. Q: Do I need to be really good? A: No. We’re committed to helping everybody develop. Q: Where does the $25 go? A: The Coyotes maintain the course in conjunction with Middlesex Twp. We pay for maintenance equipment and construction of tee pads, new baskets etc. We also have a big end of season Tag Finale match with tons of food, fun and prizes! This entry was posted in Updates on April 5, 2018 by todd.